The story pasted here was published in the Boston Globe on February 12, 2010 and written by Globe reporter Jason Woods. 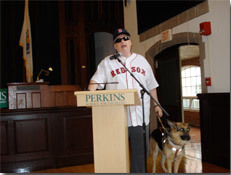 In the article, Red Sox fan and technology expert Brian Charlson talks about being a blind baseball fan and the importance of web accessibility. You can read a summary of all posts on this website about Major League Baseball’s web accessibility initiative in the MLB.com Accessibility Category. Like any true Red Sox fan, Brian Charlson attends as many games as possible and listens to the rest, play by play, on the radio. But when it came to reading stats, his blindness sometimes got in the way. At the urging of Charlson and fellow advocates, Major League Baseball rolled out a series of accessibility features this week on all league and team websites aimed at making statistics, ticketing, and other information fully accessible to the visually impaired. Charlson, who lost his sight at 11, has long struggled to access information on league websites. In 2008, Charlson and a low-vision friend went on a baseball tour, attending eight games in six cities over eight days. They used the Internet to plan their entire trip, from hotels to tickets to transportation. However, they were often met with websites that were not easily navigated by the visually impaired. After Charlson and several blindness advocacy groups approached Major League Baseball last year with their complaints, they were surprised find their suggestions not only welcomed, but fast-tracked. “We’ve never experienced that, where we didn’t have to hold someone’s toes to the fire,” he said. The features, which were announced Wednesday, are the result of a joint effort between Major League Baseball Advanced Media and the American Council of the Blind, Bay State Council of the Blind, and the California Council of the Blind. Charlson accesses the internet using text-to-speech software that reads the links and makeup of websites he visits. Web developers take each piece of information on a site — links, pictures, video — and embed HTML descriptions that Charlson’s software can see and read aloud. Now, Major League Baseball websites have a small feature that is virtually invisible to sighted users but that gives Charlson everything he needs to take advantage of the wealth of information on the sites. “It’s what’s called a zero pixel gif, that’s too small for you to see it because it’s just a dot,” Charlson said. While the dot is inaccessible to traditional point and click users, Charlson’s software finds the information and reads it as a link, allowing him to access features. As the league developed solutions, Charlson said he got goosebumps as he began to follow and interact with his favorite team like an average fan — even voting for the All-Star Game for the first time. Charlson hopes the effort will lead to other professional sports and organizations improving their user interface for the vision-impaired.